USB flash drive is most commonly used gadget to carry around one’s personal data around owing to its small size. I carry a lot of applications around in my USB flash drive with lot of portable applications and files, taking backup is a regular activity that I need to do. Backups can be taken of the data by copying and pasting the contents in a folder in your computer but there are certain instances when we may need to make a exact copy of the USB flash portable drive. In these scenarios the free tool called USB Image Tool is very useful as it can create the exact copy of the USB drive contents. 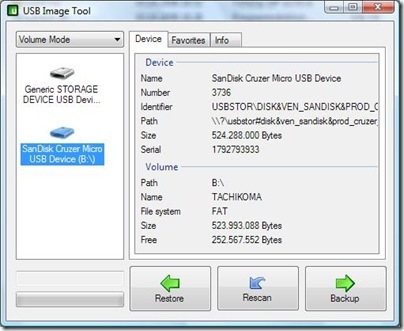 Also it can restore the data from the image file that was created to the USB flash drive. Create image files of USB drives. 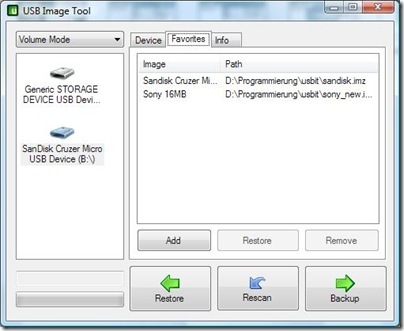 Restore images of USB drives. Use as a command line utility. We tested this tool in Windows XP and Windows Vista and it worked flawlessly.